Being in a relationship takes work. It is not something that once you are in, it is easy to just breeze through and keep going at the pace you were in when you first fell in love. Whether you are dating or married, sometimes you have to take time for yourselves and have a special "date night". Crated With Love, created by licensed marriage and family therapists Tyler & Michelle, was born after they noticed how much date night strengthened their relationship. They were at a point in their lives where they were surrounded by stress and the first thing to go was their one-on-one time together. They decided to create a $20 a month budget to spend on a date night. After few months in, they started to see how much that time together was strengthening their relationship and figured many more couples could benefit from their experiences! Voilà Crated with Love was born! There are three ways to try out Crated with Love. You can try the Digital Subscription, the Story Mode Subscription or the Gift Subscription. The Digital Subscription is $1.99 per month and with this you can reconnect with weekly games and challenges, create your own relationship profile, only see content that matters to you and it is delivered via email. The Story Mode Subscription is $19.99 per month and with this you get one new date box every month, new themed adventures every month, access to month bonus content and free shipping. The Gift Subscription is $59.99 for 3 months. With this subscription you get to send a couple you love a date night every month, customize how months you'd like to gift, choose the ship date and you get free shipping. 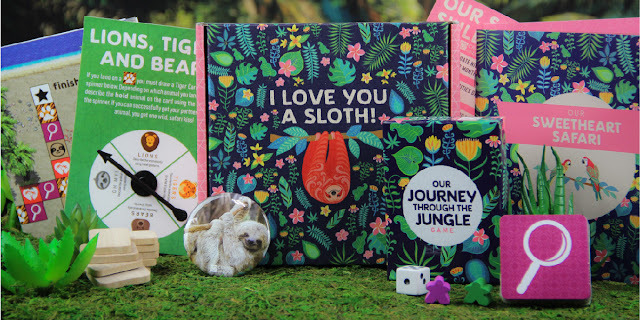 I received the I Love You A Sloth Date Night Box (pictured above) to try out and play with for Valentine's Day. It comes with everything pictured. You get: gameboard, instructions, safari skills, spinner, sweetheart safari date night book, our goals journal, Toucan badge, sloth pin, Our Journey Through The Jungle game pieces (die, cards, game pieces) and game tiles. What is nice is that every box they ship includes 4 or 5 date night challenges/activities along with all of the items that will be needed to help inspire quality time together so that couples can reconnect. So I tried the game out with my boyfriend and we enjoyed it. I felt that we were able to get quality time together and make a nice date night out of the game. We are not that serious yet, but I feel as though these games could definitely help out a serious couple get more quality time together. This would make a great date night activity to do for couples that have been together a long time and need to relax a little and get the stress out of their relationship. Often we bring all of the extraneous daily stress and activities that occur into our relationships, thus hurting them. It takes a toll on marriage and can cause a relationship to sour and maybe even cause divorce. If more couples would take the extra time to carve out some "date nights" and have more fun, then it would help to save more relationships. Subscribing to a content service like this would definitely be helpful for many couples who feel they need to add some help to their relationship (or to those who possibly just need a little bit of help). Crated With Love is a great service that has a lot of satisfied customers. Crated With Love is available online at www.cratedwithlove.com. Like Crated With Love on Facebook: https://www.facebook.com/cratedwithlove/; Follow Crated With Love on Twitter: @cratedwithlove; Follow Crated With Love on Pinterest: https://in.pinterest.com/cratedwithlove/ and Follow Crated With Love on Instagram: https://www.instagram.com/cratedwithlove/.